In today’s installment of the POETIC BLOOMINGS READING ROOM, we open the book on one of our longest standing participants here in the garden. His story is a fascinating read when splayed out in his poems and prose, and who knows what else that describes him. He loves his family and his country, and that big eared mouse down Florida (and California) way. Proud of his military background (as are we) and could be considered a patriot. His faith has been his saving grace and shows itself in almost everything he presents. And his heart is on display clearly in the works of poetry he has offered here at POETIC BLOOMINGS and other sites with which you are familiar. He has traveled a very diverse road and we’re happy he has chosen to share his heart here. In the 25th edition of the PBRR, it is appropriate that I give you Earl Parson’s “The Road”, from Prompt #190 – Going For The Gold”. A long-running poetic talent among us, that’s for certain! Glad to count you among us, Earl! Marvelous man, perfectly poetic, appropriately appreciated and given a Right Coast toast from the Left Coast. Thanks for your many fine works and support of other poets, Earl. Live long and tan well! Certainly, Earl was one of those “need to read” poets back when we started at Poetic Asides. He remains so to this day. You know that whatever he writes it is everything Earl believes and follows. You are truly a credit to us here, Earl. Thanks for the continued exceptional work. Great intro to Earl and great poem. Well, I woke up from my usual sleep break at 4am this morning and checked my emails. I opened this one and with blurry, sleep deprived eyes, I started reading. Somewhere about half way, I thought to myself that the person being lauded sounded kind of like someone I knew. Then you threw in California and it tripped me up for a bit. But, then, it was 4am. Thank you so much. It ls an honor to be with this group, and it is this group that has brought out so much more of what lingers in the synapses of my noggin. Walt and Marie, you two truly do know how to make people feel at home and how to come up with prompts that set the brain in motion. And to the many others in this family, thank you for your contributions and support. May God continue to bless PB and all that abide within. Earl, this is a poem I want to read again and again. Outstanding. Thank you for your friendship to this newbie. Earl, love the featured poem of yours on this interview. And loved the interview and learning and remembering more details about you. 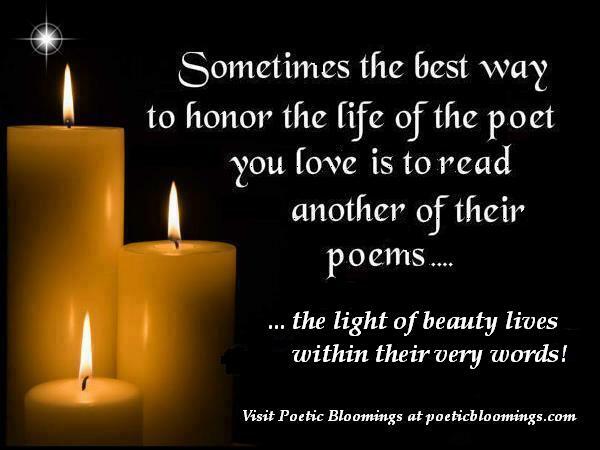 It’s an honor to write with you on this site and enjoy the inspiration and the insight you share in your poetry. I like this poem for lots of reasons, including the shape, which suggests a highway with side trips. Wonderful work. Never thought of that. Nice observation!